Drive the McDowell Quilt Trail and see…100 quilt blocks! It’s no secret that we’re big fans of small towns. We can rave for hours about the charming, laid back small towns near our Bed & Breakfast — Black Mountain, Montreat, Chimney Rock, Old Fort, etc. Our small towns are one of the reasons we love living here and one of the reasons people love coming to visit our area. The value placed on having a strong sense of community in western North Carolina small towns is so unique in this day and age, and truly special. Local businesses run by local residents are the norm around here. Waving or saying hello to people (friends and strangers alike) that you pass on the sidewalk, also the norm. Small town parades and street festivals and farmers’ markets and other fantastic community events…the norm. An emphasis on keeping the charm of today’s small towns intact, very much the norm. So it was very cool but no surprise when one of our nearby small towns, Old Fort, was host to a special community-wide ceremony on September 23, to commemorate the 100th quilt block on the McDowell Quilt Trail. 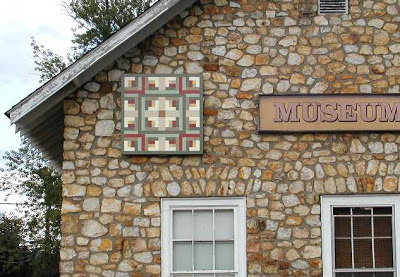 Sponsored by the McDowell Arts Council Association, the McDowell Quilt Trail — a driving trail to view painted quilt blocks on buildings in our county — was established in June of 2009. Our community, proud of its Appalachian arts heritage and supportive of the preservation of that heritage and supportive of community projects, jumped on board very quickly and the Quilt Trail Committee began installing the first quilt blocks in September of that year. In just two short years, the Quilt Trail has grown by leaps and bounds, with blocks appearing on businesses, homes, schools, churches, libraries, as well as government and community buildings, and the 100th block has now made its debut! Located on the Mountain Gateway Museum and Heritage Center in downtown Old Fort, the block is a Log Cabin quilt pattern. The museum, originally a community building, opened to the public as a museum in 1971. The grounds of the museum along Mill Creek include two log cabins dating back to the mid-1800s. If you’re interested in seeing quilt blocks on display while you’re in our neck of the woods, the closest to the Inn on Mill Creek include our own two on the north and south sides of the Lake House (#22 and #23 on the Quilt Trail), as well as the blocks in Old Fort at the woodworking shop, the railroad depot, Town Hall, the Rockett Building (site of Old Fort Mountain Music on Friday nights), the library and of course the museum.